Bluetooth-enabled accessories have revolutionized the helmet communicator market. Originally, one could only use them for talking to friends who had the same kind of device. Now, riders are using helmet communicators for a host of activities: phone calls, music, and turn-by-turn directions. Through all of these, the rider is using a smartphone to provide the information via audio cues. What if a smartphone could interface with the motorcycle and relay that information to the rider via Bluetooth? 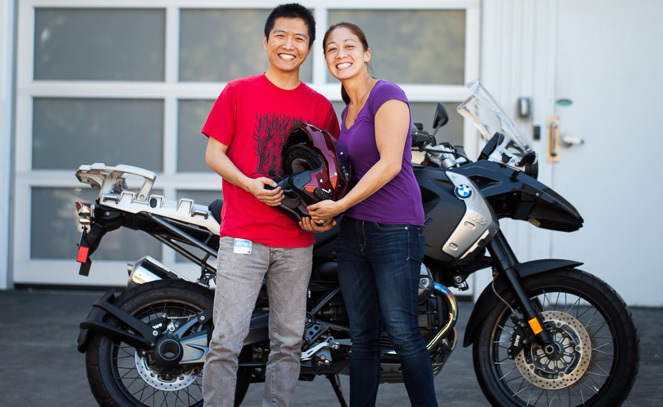 This is exactly what Stephanie Moyerman, a 29-year-old with a Ph.D. in astrophysics and cosmology from the University of California, San Diego, pondered as she commuted on her Kawasaki Ninja 300 to and from work at Intel’s Chandler, Arizona, campus. Moyerman holds up a prototype version of the Edison to CAN bus system. With so many features already baked into the Intel Edison chip, the final product could be even smaller. Ideas such as Moyerman’s are the reason why the Intel’s New Devices Group (NDG) exists. A BMW R1200GS was selected for the project because of the central access to the ECU’s information via the CAN (controller area network) bus. 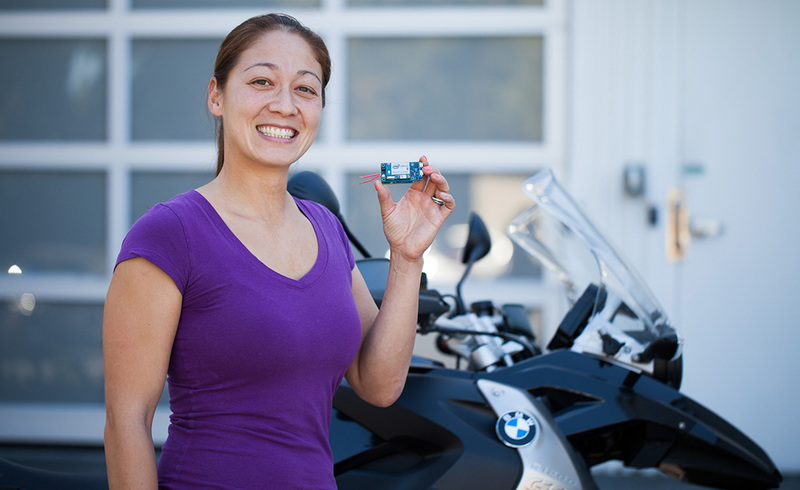 Development of the Intel Edison to the BMW CAN bus translator was run by a two-person team, consisting of Moyerman and software engineer, Xiaochao Yang. Initially, they built a large, CAN bus interpreter on a breakout board for the testing and debugging stage of development. This involved decoding what information is being transmitted over the CAN bus so that it could be used by an Android app for interacting with the rider. “The CAN bus data is all in bike code, and you can see all these bytes fly by like watching the Matrix,” said Moyerman. “And you’re hacking it all apart and putting it back together.” Later versions of the unit are constructed in a much smaller form factor – one that would actually fit in the limited space on a motorcycle. With the basic hardware construction and CAN bus decoding done, an Android app acts as a liaison, allowing the rider to communicate via voice to the smartphone through a standard Bluetooth helmet communicator. To interact with the R1200, the rider simply says the trigger phrase, “Hello, Jarvis,” prior to any commands. The Google speech API built in to Android takes care of the rest. Here is the unit on a breakout board early in the development process where Moyerman and Yang were decoding the CAN bus data. If you’re wondering why you’d need to communicate with the bike when you can already get directions and other information directly from your phone, the advantages are numerous. Moyerman’s Edison test unit is capable of checking the distance required in a set of turn-by-turn directions and comparing it to the range remaining in the BMW’s tank. In low fuel situations, the app includes a stop at a gas station in the directions and notifies the rider. A verbal pre-ride status check is also available, allowing the rider to know that oil levels and tire pressures are within parameters. In the event of some bike system malfunction, a verbal notification can augment the easy-to-overlook warning light. Controlling other connected devices (such as cameras) verbally via Bluetooth or WiFi is another logical extension of the system’s potential that would allow the rider to perform tasks while keeping hands on the bike’s controls where they belong. If this product takes off, you’ll be able to communicate with your motorcycle verbally while you ride. Developers Moyerman and Yang are enthusiastic at the prospects. However, Moyerman isn’t just looking to the application of this system to premium motorcycles, like the BMW test mule. She’s got her eye on worldwide markets where motorcycles aren’t luxury toys but necessary, daily transportation. Implementing a variation of the Edison system could, as envisioned by Moyerman, give riders warnings that something is approaching in a blind spot – a common occurrence in the crowded urban riding conditions experienced in developing countries. According to Moyerman, the Edison system could be employed in a much more cost-effective way than other systems, like the Skully AR–1 helmet. 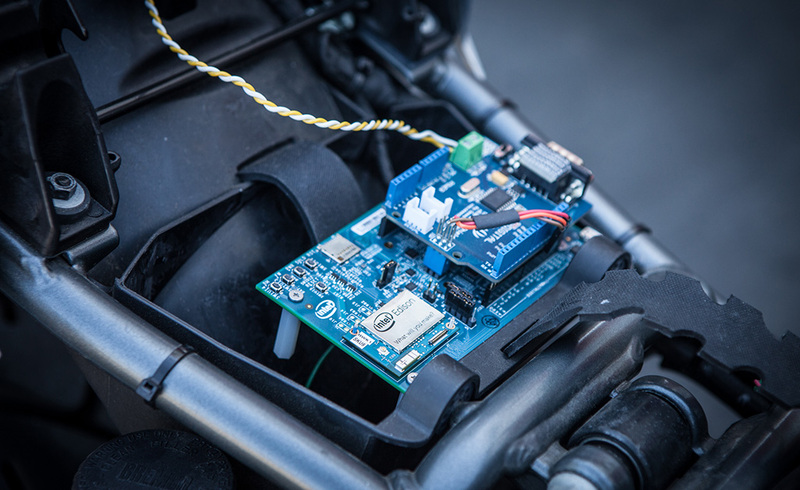 The prototype of the Intel Edison system for the BMW CAN bus is being introduced to the public this week at the Mobile World Congress in Barcelona, Spain. As with all proof-of-concept prototypes, it is nowhere near ready for primetime and has only limited functionality. However, the fact that Intel’s New Devices Group believes that it is far enough along to be shared with the public – and the non-riding public. We’re anxious to see what comes of this effort and whether other bike manufacturers get involved.